In the week after the school shooting in Parkland that left 17 dead, a Colorado hotline made for students to anonymously share safety concerns saw 50 percent more reports – most were on details of planned school attacks, which resulted in arrests. The Safe2Tell program was created in response to the 1999 massacre at Columbine High. Utah and Nevada have similar programs, Arizona just approved a hotline bill with $400,000 in funding, and Florida is working with the Colorado Attorney General’s Office to potentially set up their own program. 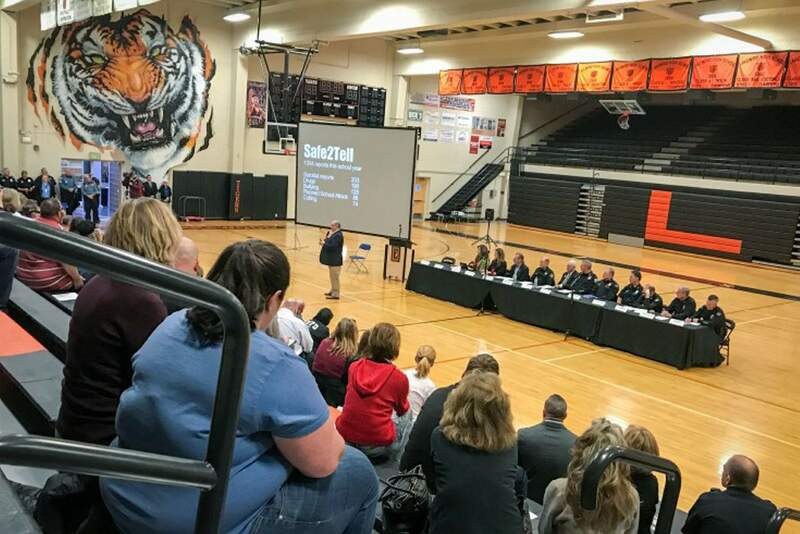 John McDonald, the executive director of security for JeffCo Schools, says his district alone has received more than 1,300 anonymous reports during this school year through Safe2Tell. Kids can use a mobile app, the phone number or the website to report their concerns, which are answered 24/7 by the Colorado State Patrol. “If it’s important enough for them to call, it’s important enough for us to respond,” McDonald says. School districts get each tip line report and work with law enforcement on how to follow up. When a student is in danger, McDonald says they move fast. Susan Payne, the director and founder of Safe2Tell, has a history as a school resource officer in Colorado Springs. She was hired there after a school shooting. For Payne, the anonymity of Safe2Tell – codified in state law – sets it apart from 911 and other hotlines. “We know that the most interrupted acts of violence or prevented suicides is because a lower threshold concern was brought to our attention and caring, committed adults followed up,” Payne says. She argues that other preventive solutions are also necessary, and says schools need more money to respond to mental health and violence issues. Democratic State Sen. Nancy Todd recently introduced a bill to increase spending for suicide prevention in schools – one that didn’t have enough votes to advance. The Columbine shooting also prompted researchers at the University of Colorado Boulder to create a center for the study of violence prevention. They work with schools to teach prevention and intervention tactics. Bill Woodward, the center’s training programs director, says Safe2Tell is like an emergency exit. “You want to get upstream and see what else is happening, what else is going on in the school that we can get ahead of now so the kids don’t have to use the emergency exits,” he says. And like emergency exits, Woodward believes Safe2Tell should be required in every Colorado school. It is, however, up to individual districts to promote the program.